This adventure has action-man violence that gives itself airs as the family of an American businessman (Robert Culp) in Greece is kidnapped by a terrorist group and taken to a monastery on top of a needle-shaped mountain. 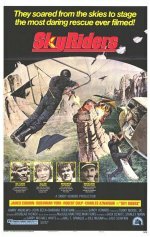 But never fear, to the rescue comes a group of hang-gliding freaks led by soldier of fortune James Coburn (who's also the ex-husband of Culp's wife). Appearing to let us know it's on the side of democracy, instead it shows us that wife Susannah York isn't wearing a bra and that Coburn is as emotionless as a cold fish. Excellent hang-gliding stunts, though.